Bronte Beach is one of the best places in Sydney to watch a sunrise. While it's cold here in winter, Sydney tends to get the most intense colour sunrises and sunsets in late autumn, winter and early spring so it's often worth braving the cold and go shooting. Take a cup of hot coffee with you - you will need it for a winter sunrise. This image belongs to the travel and nature stock photo library. This stock photo of Beautiful Sunrise at Bronte Baths is available for licensing for commercial and editorial uses including websites, blogs, books, magazines, brochures and advertising. Restrictions may apply for images which contain third party copyrighted material or sensitive subjects. Photos of artwork are for editorial use only. 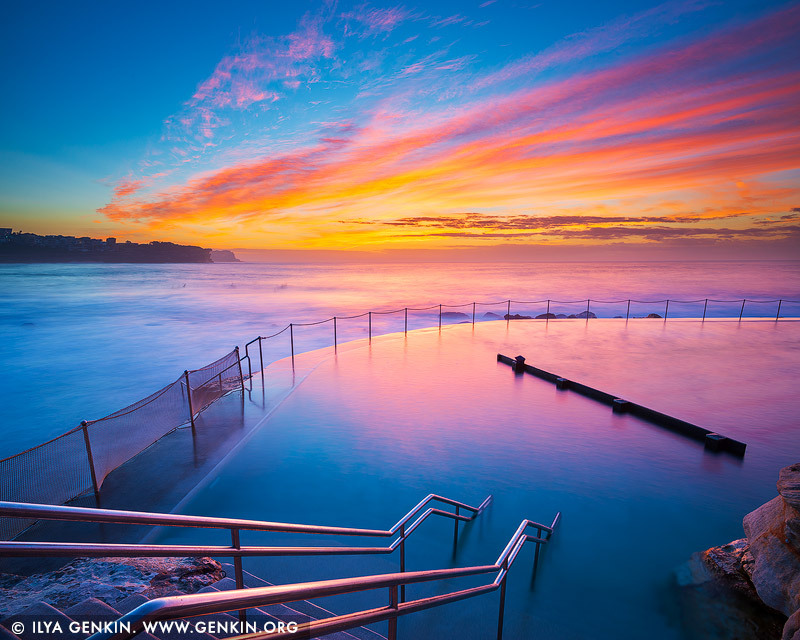 This image id AU-BRONTE-BEACH-0007 of Beautiful Sunrise at Bronte Baths, is copyrighted © by Ilya Genkin. This is not a public domain image.